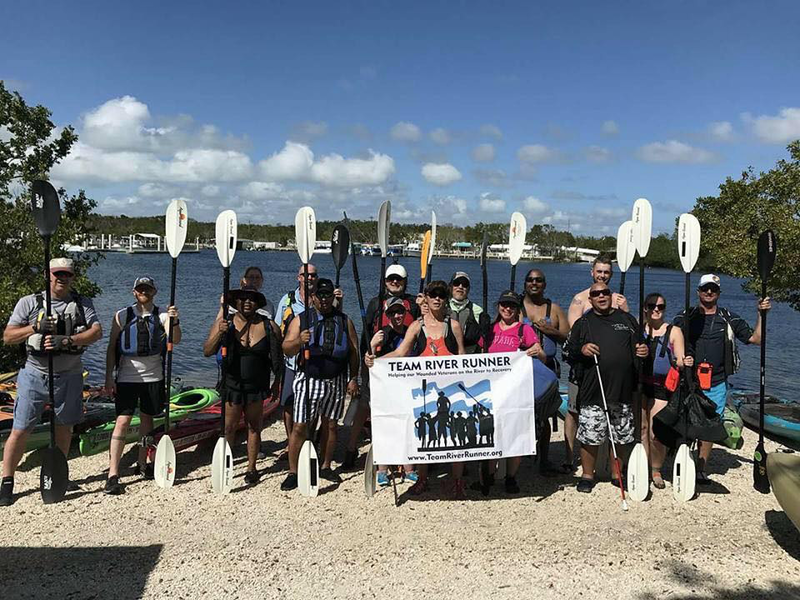 What would you do if you were given the opportunity to go on a weeklong kayak trip with a group of complete strangers? Some of you would jump on the chance and never look back, for others you would say no way, and for some like myself you would jump on the chance but you would take along two friends; Anxiety and Fear. This is exactly what happened to me when I was given the opportunity to attend the Team River Runner Key Largo OuttaSight Clinic in February. However, due to the teamwork, acceptance of the group and the strong leadership my friends Anxiety and Fear stayed at the Miami Airport while I continued traveling to Key Largo with a group of new friends that I will never forget. Since I’ve returned I’ve been asked about my experience. I’ll be honest it’s been difficult to put the week into words. There were so many things that happened and experiences that can only be fully appreciated if you were there in person. However, here’s a glimpse into what I experienced and witnessed during the TRR Key Largo OuttaSight Clinic. The group was comprised of 18 individuals from all over the east coast and one individual from Nevada. There were 7 OuttaSight paddlers. You may be asking yourself, what’s an OuttaSight paddler? An OuttaSight paddler is an individual who is blind or vision impaired. In addition to being an OuttaSight paddler I also had the unique opportunity to put my professional skills to work throughout the week. When I’m not in my Dagger Mamba I’m a Certified Orientation and Mobility Specialist. A what? I teach individuals with vision loss how to safely navigate their environments with grace and dignity. In most situations, this is done with the assistance of a white cane. Each day started with morning briefings. We would meet as a whole group then split into two smaller groups. 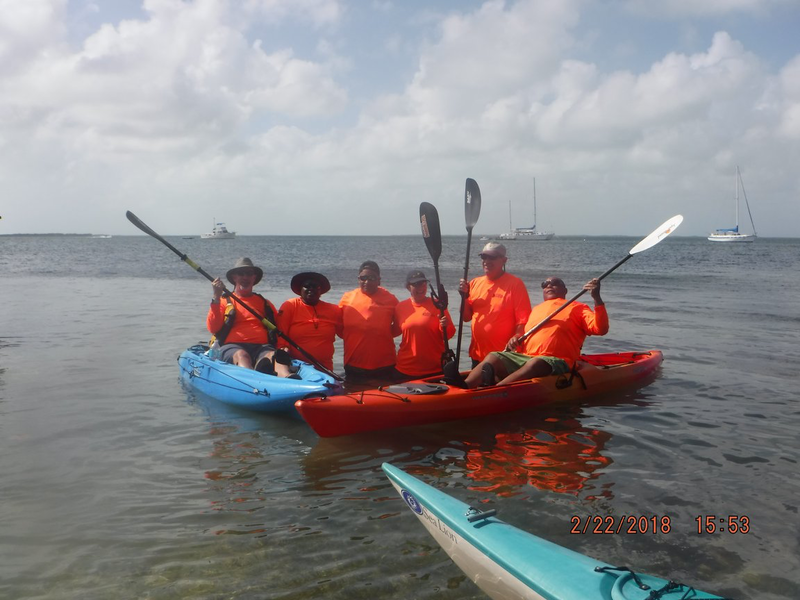 One group consisted of OuttaSight paddlers and the other was comprised of guides. This gave each group the opportunities to share thoughts of the previous day, or to share information. 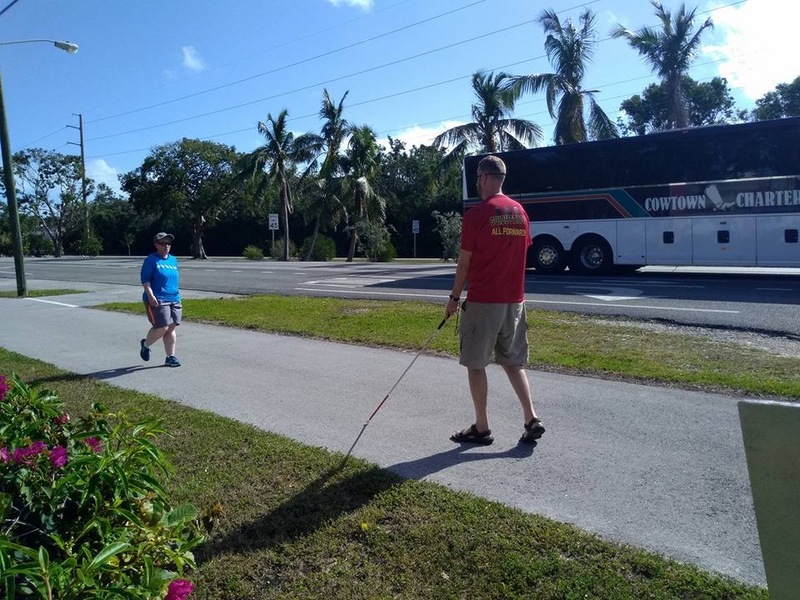 For example one day the guides were put under blindfold and handed a white cane to experience being vision impaired, while the OuttaSight paddlers explored a new piece of equipment called Ira Vision. After the morning briefings it was time to load up and travel to the put in location for the day. We all came from different levels of paddling. Our guides consisted mostly of white water kayakers. They had a learning curve to get used to the larger sea kayaks which required a wider turning radius. 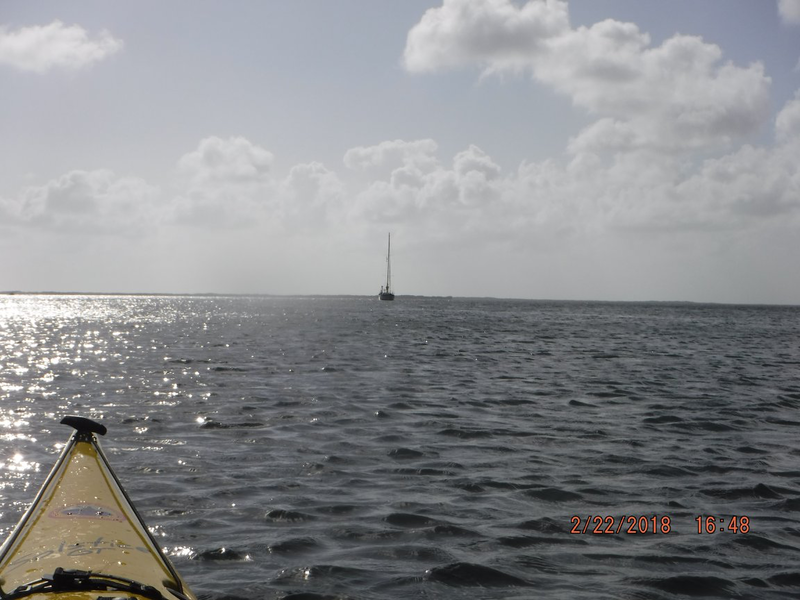 Two of the OuttaSight paddlers were avid flat water and sea kayakers. 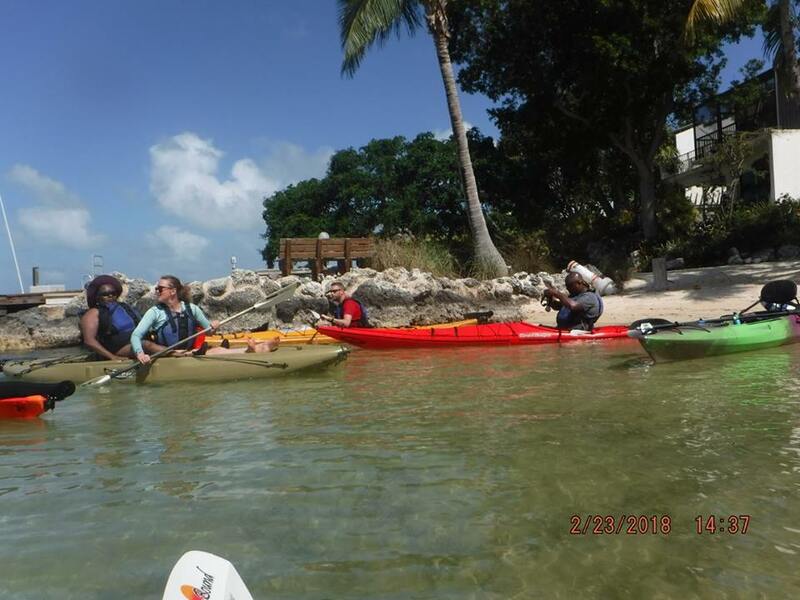 For three of the OuttaSight paddlers this was their first time in a kayak. However, once we were all in our kayaks and in the water we looked a group that had been paddling together for years. however the wind was still able to find us. One day we found ourselves in open water paddling into 18-20 MPH winds. This was perhaps my favorite paddle day, because it was like being back in white water. Sure, paddling was the purpose of the trip and for some the highlights, but there was much more to the week. 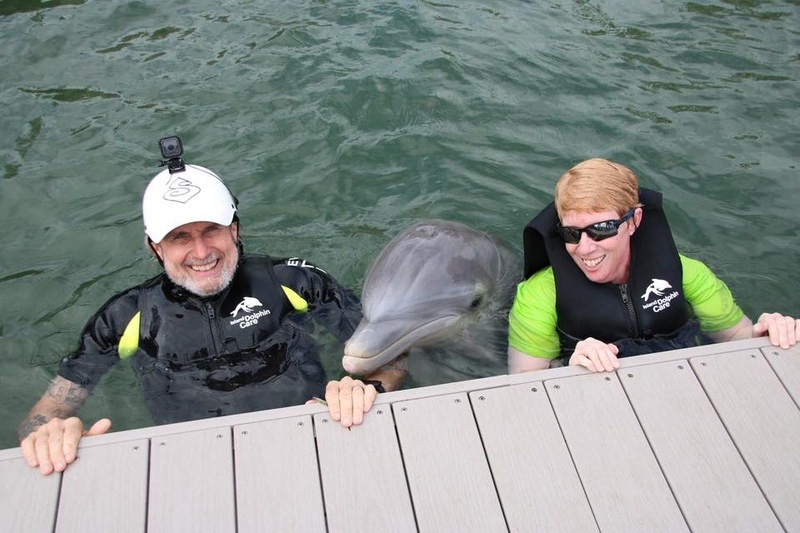 One day we were given the opportunity to swim with dolphins. This was truly amazing. There is nothing more freeing than to be able to grasp the dorsal fin of dolphin and glide through the water. 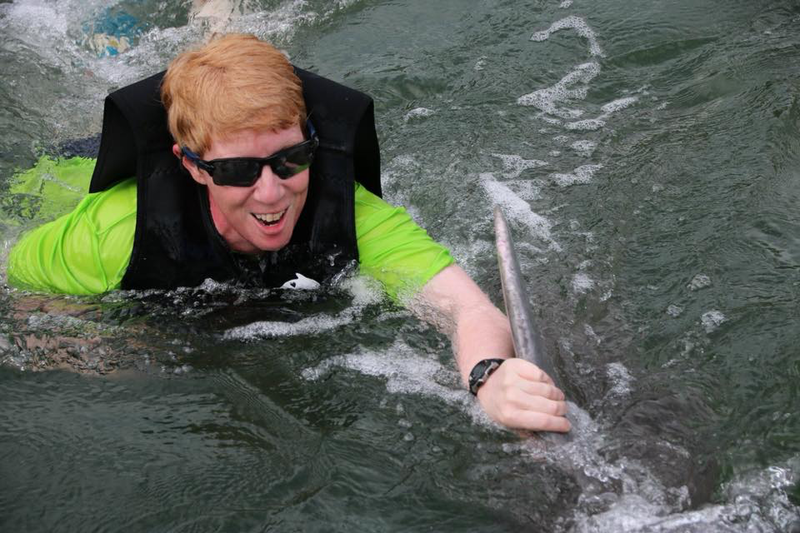 Or, being able to snorkel while several dolphins just swam around you as if you were one of them. 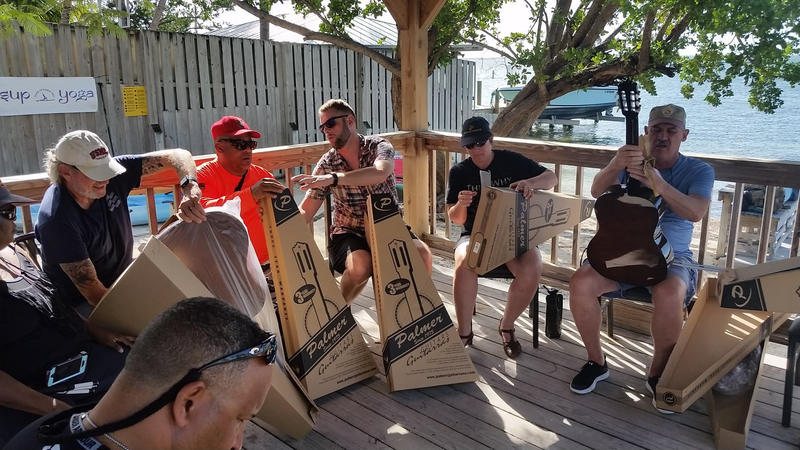 At the end of the week a gentleman showed up at our location and asked if the Veterans would like to learn how to play the guitar. It turned out that he runs a program called Guitars for Vets. He gave each Veteran a brand new guitar to keep plus an hour long lesson. What I’ve summarized are things that occurred on the surface. Below the surface you would find that complete strangers came together as One. You would find individuals who overcame fears. You would find individuals who shared very personal insights and stories. You would find individuals who learned to trust others. You would find individuals who found their inner child. You would find individuals who stepped up and became leaders. You would find individuals who found a new purpose in life. Most importantly you would find individuals who shared an experience that they are truly grateful for and will never forget. If you have paddled with SVTRR, you know Bill’s number one rule, “If you are not smiling, you are doing something wrong”. Let me just say, based on the amount of smiles captured in Key Largo, we defiantly did something right. Every day I discover a new reason, why I’m thankful for my TRR family. I can’t begin to express how grateful I am to have had this experience. 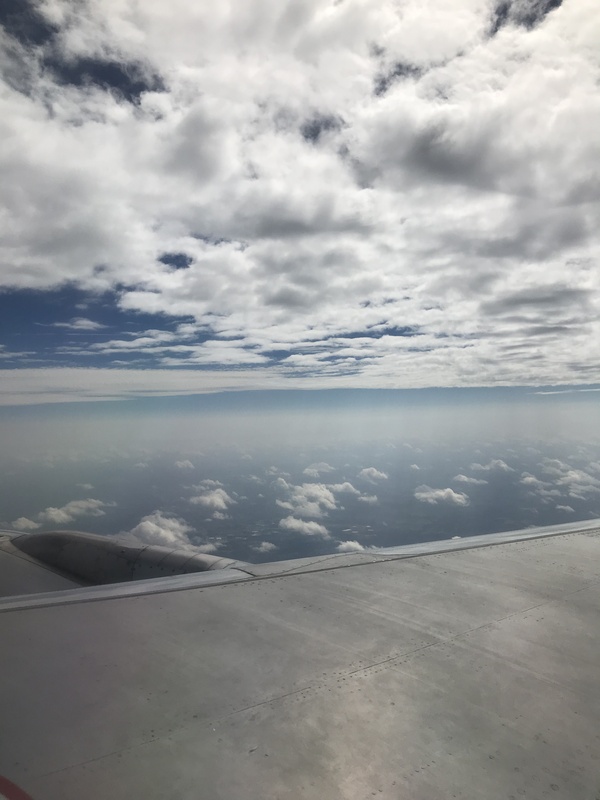 Not only was I able to leave my friends Anxiety and Fear at the airport, but I was able to reconnect with my inner child during this experience. Next time you see me on the water please ask me about this experience, because there is still so much more to share. 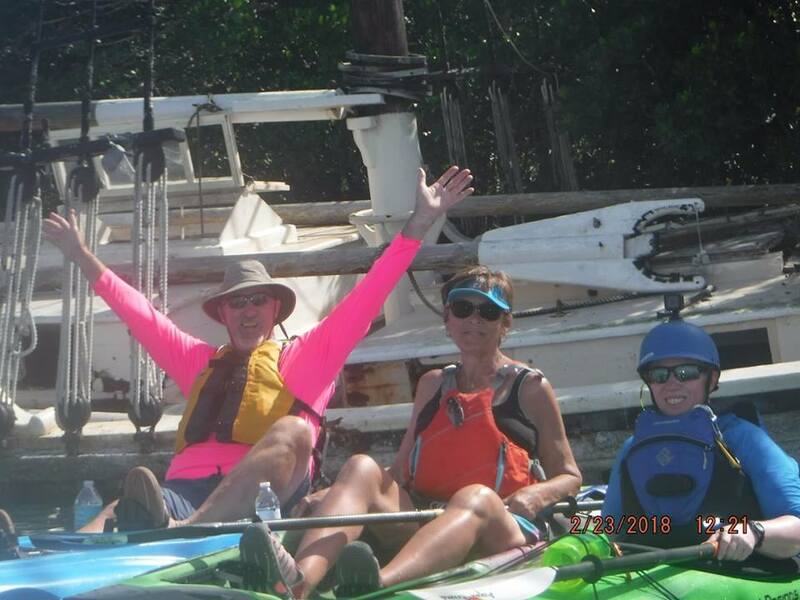 What a great experience to share the love of kayaking with others. Thanks for sharing this story and experience with your blog community. Jenn you absolutely captured our adventures beautifully, both on and off the water! Thank you so much for taking the time to explain some of the amazing experiences that came together to create this Clinic. You were a huge part of making Key Largo such a success and I am looking forward to working with you on many more Outtasight Clinics!